David Carlton Brown was born on April 19, 1944 and joined the Armed Forces while in Fort Monroe, Virginia. He served in the United States Army and in 2 years of service, he attained the rank of CAPT/O3. On September 7, 1968, at the age of 24, DAVID CARLTON BROWN perished in the service of our country in South Vietnam, Quang Duc. David Carlton Brown was born into an Army family at Fort Monroe, Virginia, on April 29, 1944. He was appointed to the United States Military Academy at West Point in 1962 and graduated in the class of 1966, being assigned to the Infantry. He then attended both Advanced Inantry and Airborne Schools and was assigned as a Platoon Leader and later Company Commander in the 503rd United States Infantry, 173rd Airborne Brigade. On September 7, 1968, he was killed-in-action in the Quang Duc Provence of South Vietnam. During his short military career, Captain Brown earned the Bronze Star with two "V" devices for valor, the Bronze Star with Oak Leaf Cluster, the Air Medal,the Purple Heart and the Combat Infantryman's Badge. 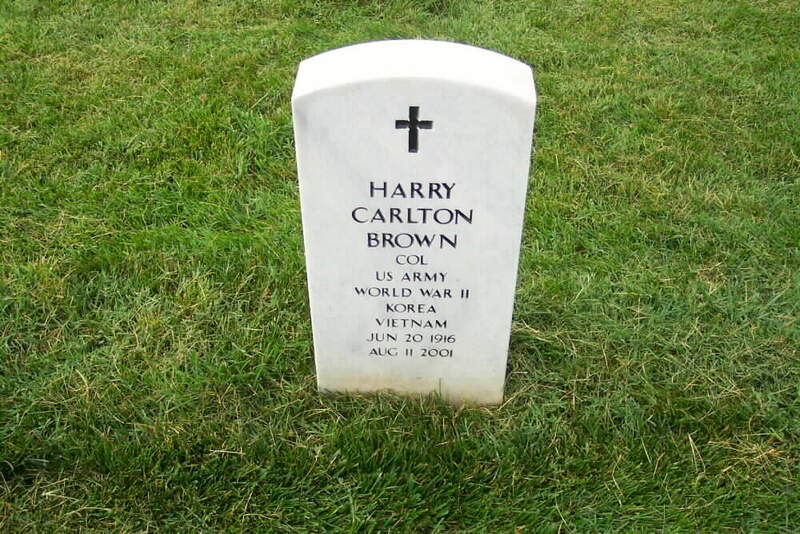 Captain Brown was buried with full military honors in Arlington National Cemetery. He was survived by his parents, Colonel Harry C. Brown, United States Army, and Sheila Brown, as well as by his brother, Jeffrey Brown. David was my best friend. He was the friend that I was meant to have for my whole life. We would always have been in touch and we would have shared every detail of our life experiences. David and I met each other as we were starting our sophomore years in a new high school in a suburb of Washington D.C. I thought he was a nutcase, an immature army brat. I tried to avoid him for the first part of the school year but he was always around. Sometime toward the end of the year we had a fist fight in the school cafeteria. We were hauled off to the principal's office and made to write out the reasons why we had fought. I don't remember why. I do remember that no matter how hard I tried I couldn't make it look important on paper. By the start of the junior year, David and I were best friends. We did all of the things teenage boys do, the good and the bad, together. David had an infectious laugh that would light a room. There were not many trails that he and I didn't explore in Northern Virginia, he in his VW Beetle and I in my old Ford. David was always better than me. He didn't know it and I wouldn't admit it. He was strong of spirit and principaled. After we finished high school and had some summer time to relax, David went off to West Point while I went off to university and was sworn in as a Naval midshipman. Duty, Honor and Country were what David was all about. We saw each other off and on throughout our college years. Then David went off to Vietnam while I finished college, married, went into flight training and had a son. The hardest day of my life came when David's parents called one day while I was still in flight school to tell me that David had been killed. A piece of me died that day with David. I have missed him my whole life, sometimes painfully so. With David's death, the world lost a bit of laughter and became a little less bright. Nobody will ever know what gifts were lost to the world because David and thousands of others like him had their lives cut off before they reached full bloom. I can only visit this virtual wall and remember and imagine and wish and wonder at what might have been. I will always remember David and I will always love him. In some small way he will go on.